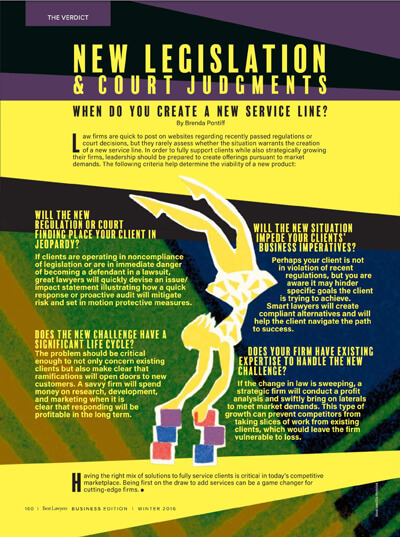 Will the new situation impede on your clients’ business imperatives? Perhaps your client is not in violation of recent regulations, but you are aware the new ruling may hinder specific goals the client is trying to achieve. Smart lawyers will create compliant alternatives and will help the client navigate the path to success. The problem should be critical enough to not only concern existing clients but also include ramifications that could open doors to new customers. A savvy firm will spend money on research, development, and marketing when it is clear that responding will be profitable in the long term.